1860, sharkskin/brass wire inlay, iron fittings, found on Kangwha Island, Kyung Ki Do Province. Certified. This chest was found on Kangwha Island, a political prison colony for the Kingdom of Korea for two thousand years. It was discovered by a missionary doctor who went to the prison to treat the sick and dying after the Japanese Occupation. 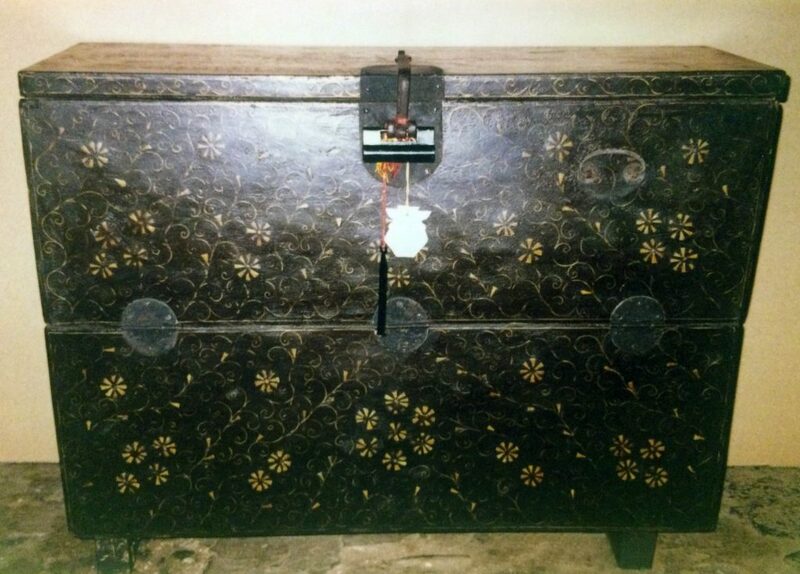 This chest, highly decorated with rare sharkskin and reverse brass wire was most likely property of a concubine from the palace to use it to store her clothing. Furniture was not highly value by the government at that time so she was allowed to take it to the prison with her for personal use. It was certified by one of only thirteen certifiers approved by the Korean government in the 1900s as rare.